Draft 2040 Santa Cruz County Regional Transportation Plan (RTP) and Draft Environmental Impact Report (EIR) for the Draft 2040 Metropolitan Transportation Plan (MTP) and its Sustainable Communities Strategy (SCS), which includes environmental review of the Santa Cruz County Draft 2040 RTP. The Draft 2040 Santa Cruz County Regional Transportation Plan (RTP) is available for public review and comment from December 8, 2017 to February 5, 2018. A public hearing for the Draft 2040 RTP will be held at 9:30am on Thursday, January 18, 2018 at the Santa Cruz County Regional Transportation Commission meeting located at the City of Santa Cruz Council Chambers, 809 Center St, Santa Cruz, CA 95060. 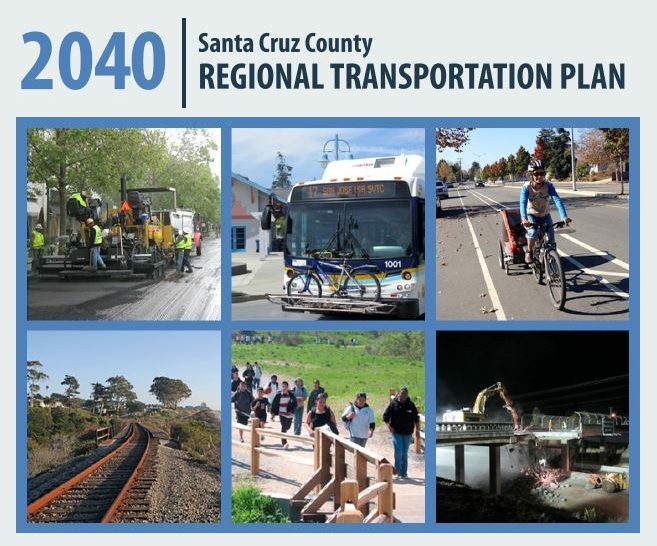 The 2040 RTP is a long range (22 year) transportation plan for the Santa Cruz County area. The long range transportation plan assesses the transportation challenges we face now and those we will face in the future. The plan includes strategies to address our transportation challenges, a list of transportation needs (highway, road, transit, bicycle, pedestrian, freight, airport, etc. ), and priorities for limited funds. The RTP is updated every four or five years to address new trends, issues, and priorities, and to incorporate new state and federal regulations. The potential environmental impacts of the Draft 2040 RTP are collectively detailed in one Draft Environmental Impact Report (EIR) for the Draft 2040 Metropolitan Transportation Plan (MTP) and its Sustainable Communities Strategy (SCS), which encompasses the three RTPs for Santa Cruz, Monterey and San Benito Counties. The Draft EIR is available for public review and comment from December 4, 2017 to February 5, 2018. A public hearing for the Draft EIR will be held at 7:00pm, following an open house that begins at 6:00pm, Tuesday, January 30, 2018 at the Live Oak Community Complex (Simpkins), 979 17th Street, Santa Cruz. The Draft 2040 RTP and the Draft EIR can be found at www.sccrtc.org/2040-rtp and copies are available at Santa Cruz County libraries. Written comments on the Draft 2040 RTP for Santa Cruz County can be submitted to draft2040RTP@sccrtc.org. Written comments on the Draft EIR for the 2040 MTP/SCS which includes the environmental review for the 2040 RTP can be submitted to hadamson@ambag.org.